RV Shows can be daunting, and Girl Camper feels you need a strategy for tackling them and making the best use of your time. For those who are ready to buy and have done your online research, the RV Show itself is a great opportunity to see the models, different floor plans and compare prices. The tips here are helpful when evaluating what really works for you. Things you normally would not think of when dealing with the excitement of the day. Comfortable Shoes are a must! Shows are big and can easily take hours to cover the entire show. Check the show directory and schedule. Spend some time checking out all the cool gadgets and helpful seminars. Take a test drive, sit on the furniture, jump on the bed, pretend to cook a meal and take a shower! Check out everything! If you plan to boondock often to be up close and personal with nature, make sure the rig has a propane cooktop and oven. Of course, you could cook every meal outside on a portable gas BBQ. There are many RV’s out there and one is perfect for you. If you’re not 100% sure this is YOUR RV, walk away. For more details, read on. . .
Before the RV Show . . . 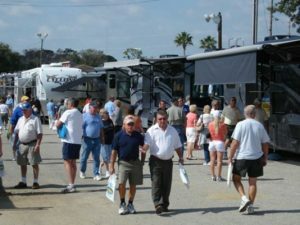 When you make plans to attend an RV show, check out the dealers and brands that are represented. Decide early on the ones to see. Most shows have a website with show maps. Often the manufacturer’s brand is located there too. Print a copy and circle the areas you definitely want to visit. This saves a lot of time and keeps the focus on the types and brands important to you. If it is a very large show, plan on visiting the show on more than one day. This might be your only chance this year to see so many rigs all together. This is also the time to look up any particular vendors of RV-related products you want to investigate. The show map also has vendors listed and booth numbers indicated. Try to plot out a walking route through the show ground. This maximizes your time and eliminates wandering through areas in which you have no interest. Keep in mind that RV salesmen can be an aggressive lot. They go to any lengths to close a deal on an RV. Keep your wits about you and be prepared. The whole process is just like buying a car. The more you know, the better deal you can work. Do not settle for less just because it is in your budget. RV shows can be useful in helping you to become familiar with the newest options that are available in RVs. It is also fun to take a peak at that 2-million dollar coach and dream about winning the lottery. However, with quality in the new RVs so low (see Recalls below), the best value in today’s market may be the older models. Look all the way back to 2000 for real quality. Be aware though, some RV parks have a 10-year limit on age. Work around this by giving your older rig a new paint job, or buy one that already looks good on the outside. Take a photo to send when making a reservation. This works 99.5% of the time. Important Note: Always have the RV inspected before signing on the dotted line. There are Certified RV Inspectors available through NRVIA.org. Another option is to hire a mobile RV repairperson for a few hours to carefully inspect it. Why do this if it is brand new? The horror stories about new RVs range from bent frames to unattached roof coverings. An inspector may not find the missing screws that allow the door to fall off, but they can find structural damage. They can check all the appliances to ensure they work properly. They can inspect the roof and side panels. They can make sure the slides work properly. The inspection process is tedious work and requires patience and endurance. An inspector knows what to look for and ensures that you do not get a lemon. For more information on RV inspections. For information on how Warranty Repair works. To find RV shows in your area . 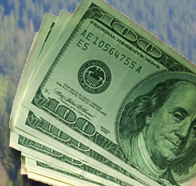 . .
Friends, here is your chance to voice your opinion on proposed National Park System fee increases. Yes, they just increased the annual pass to $80 (from $20) and eliminated the Forever Senior Pass. Now they want to raise entrance fees to $30 per vehicle or on foot or bicycle, and $50 per motorcycle. The proposed new fee structure would only be imposed at Arches, Bryce Canyon, Canyonlands, Denali, Glacier, Grand Canyon, Grand Teton, Olympic, Sequoia & Kings Canyon, Yellowstone, Yosemite, and Zion National Parks with peak season starting on May 1, 2018; in Acadia, Mount Rainier, Rocky Mountain, and Shenandoah National Parks with peak season starting on June 1, 2018; and in Joshua Tree National Park as soon as practicable in 2018. A public comment period on the peak-season entrance fee proposal is open from Oct. 24 to Nov. 23 on the NPS Planning, Environment and Public Comment (PEPC) website. Written comments can be sent to 1849 C Street, NW, Mail Stop: 2346 Washington, DC 20240. For more details, read on . . .
Cruiser RV is recalling 175 2018 Shadow Cruiser Ultra Lite recreational trailers, models ID225RBS, ID240BHS, ID263RLS, ID279DBS, ID280QBS and ID289RBS. The axles on these vehicles were installed backwards, possibly reducing the braking ability or causing the brakes to temporarily lock up. Daimler Vans USA LLC is recalling 109 2016 Mercedes-Benz Sprinter 2500/3500 vehicles. The affected vehicles were manufactured without a driveshaft catch strap, allowing a loose driveshaft to strike the fuel tank. Forest River Inc. is recalling 1,725 2015-2018 Vibe, and 2016-2018 Rainier recreational trailers. The liquid propane (LP) line may have insufficient clearance above the axle shackle. Forest River is recalling certain 2018 Forester motorhomes, model FRC3271SF. The Federal Placard may inaccurately state that the vehicle has single rear wheels and tires, when the vehicle is equipped with dual rear wheels and tires. Forest River Inc. is recalling 265 2014-2017 Berkshire XL and XLT buses. The headlights may shut off while switching from low beam to high beam settings, reducing visibility for the operator and other vehicles. Forest River is recalling one 2018 Haulin’ Cargo trailer. The labels on this vehicle may list incorrect tire pressure information. Forest River Inc. is recalling 594 2013-2014 Coachmen Freedom Express recreational trailers. The frames on these vehicles may not have had reinforcement stiffeners welded onto the exterior I-Beam in the axle area, allowing the axles to be misaligned. Grand Design RV Co. is recalling 3,621 2017-2018 Imagine recreational trailers. The wires at the air conditioning unit may detach from the connector and the loose wires may short circuit. Heartland Recreational Vehicles LLC is recalling 134 2018 Sundance XLT TT recreational trailers, models ID221RB, ID241BH, ID273RL, ID281DB, ID283RB and ID291QB. The axles on these vehicles were installed backwards, possibly reducing the braking ability or causing the brakes to temporarily lock up. Highland Ridge RV is recalling 242 2018 Open Range 3X fifth wheel recreational trailers. The labels on these vehicles may not list the correct tire size information of 235/85R16. Jayco is recalling certain 2016-2017 Greyhawk motorhomes, model 29ME. Damage to the liquid propane line can occur by the line being melted by the vehicle’s exhaust pipe, contacting the drive shaft, or being kinked at the p-clamp. Prevost Cars Inc. is recalling 3,190 2008-2018 H3-41, H3-45, H3-45 VIP, X3-45, X3-45 VIP, X3-45 VIP Entertainer, and XL2 motorcoaches. The fuel tank cradle supports may have gaps at the points where the cradle connects to the coach frame, which can allow the attachment bolts to loosen and fail causing the fuel tank to fall from the vehicle. REV Recreation Group is recalling certain 2013-2015 Fleetwood Bounder and 2013-2016 Fleetwood Southwind recreational vehicles. The welds attaching the battery tray may be insufficient. Thor Motor Coach (TMC) is recalling 1,105 2014-2016 Ace, Challenger, Daybreak, Hurricane, Miramar, Outlaw, Windsport, Palazzo, Tuscany, and Tuscany XTE motorhomes. The windshield wipers may fail due to the system being incorrectly installed or secured.